Guys stick to english please. Vu que mes dossiers de séries ne contiennent que des fichiers video en mkv, je préfère ne pas mettre de NFO, ca ferait désordre (je suis un peu maniaque ^^) du coup je vais faire sans tant pis, je vais chercher mes fichiers dans l'arborescence dans kodi). I don't think you understand what a nfo file is. It is not a video file. It is a small text file that contains the tv show information that Kodi can scrape into the library in exactly the same way it scrapes from the online sources like TVDB. Thanks for the .nfo files !!! When there is subtitle I allways remux it in the video files so no other file in my directory, only mkv or video. Je suis néophyte en la matière, je suis désolée... Pourriez-vous m'aider à "scrapper" avec Kodi pour utiliser ces NFO ? Sorry, but we are an English forum. Could you post a translation (google is ok) along with your French post. I'm new to this, I'm sorry... Could you help me to scrape with Kodi to use these NFO's ? It is important that your NFO Files are named exactly the same as the Episode files. 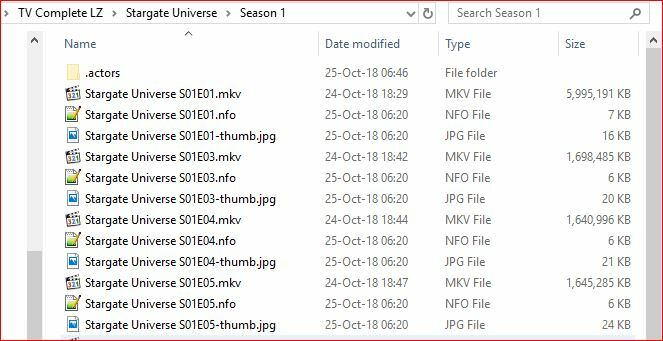 It is also important that the Season and Episode numbering is correct in the file names.